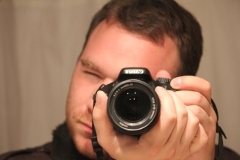 Mastering OpenCV with Practical Computer Vision Projects. I was honored to be invited to participate as a technical reviewer of the book, and it was really fun to read. 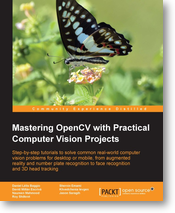 Each chapter shows a specific real world problem and teaches you how it can be solved using OpenCV. This is the work of seven authors, and the projects are great. I really recommend this book if you are already using OpenCV, because it deals with more advanced details, and in some cases it shows you how to use other libraries to fill in where OpenCV lacks for specific purposes. Some of the cool things that this book covers are how to make OpenCV powered apps for Android and iOS, interfacing OpenCV with the Kinect, number plate detection, optical character recognition (OCR), augmented reality, structure from motion, face detection and tracking. If you are interested in using OpenCV in real world scenarios, this book will definitely help you. Although you will need to know the basics of image processing or computer vision and programming first as this book is mostly focused on the actual practical projects.